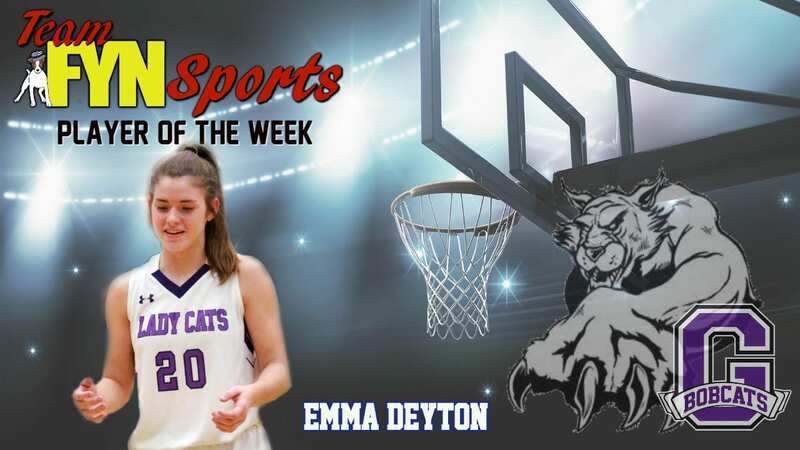 The week 5 Player of the Week for the Gilmer Lady Cats is Emma Deyton. 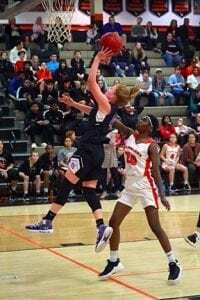 Coming as a Sophomore, Deyton plays a very mature game as she brings the ball up the court. She sees the entire floor on every possession and is unselfish when it comes to putting points on the board. Deyton can drive the lane and power her way to the basket. As mentioned above, at just a sophomore Emma Deyton will continue to help lead the Lady Cats for the next 2 years of her high school career. 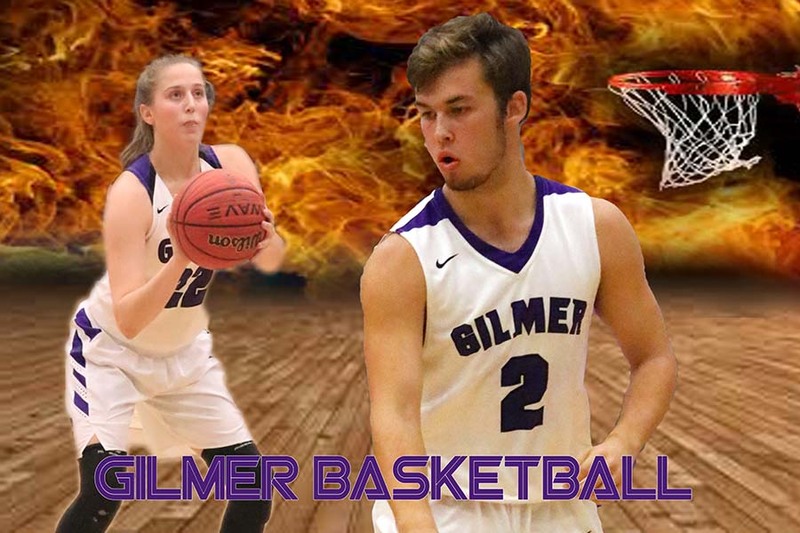 On what turned out to be a beautiful Saturday afternoon, the Gilmer teams traveled to Dahlonega Ga for non-region action with the Indians of Lumpkin Co.
First to take the court was the Lady Cats to face off against a Lady Indians team that is having a very good season out of 7-AAA. Looking to get a little tune-up before closing out the season with region action at Northwest Whitfield, the Lady Cats took the floor ready to give it all they had. As the referee tossed the ball in the air for the opening tip-off, both teams found it difficult to find a rhythm and really get anything going in the opening period of play. Senior MaryLee Callihan was 4-4 from the free-throw line and led the scoring for the Lady Cats in the first. Heading into the second period of play, Gilmer held a narrow 7-5 lead over Lumpkin. The final period before the halftime intermission had for Lady Cats put points on the board while continuing to put pressure on their opponents. Lumpkin was held to 6 points in the period and trailed 18-11 at the half. Points leaders for the Lady Cats in the first half was MaryLee Callihan with 6 and for the Lady Indians, Ashlynn Wistoski who had 6 first-half points. The opening of the second half of play had the Lady Indians continue to struggle to get the basketball through the hoop. Scoring only 6 points, the home team couldn’t find a way to cut into the Lady Cat lead. Gilmer outscored the Lady Indians in the third but not enough to stretch the lead to a comfortable level. Emma Deyton had 7 third period points to keep the Lady Cats on top and carried a 29-17 lead headed into the final period. The Lady Indians made one last attempt to cut into the Gilmer lead with 14 fourth period points. Not only did the Lady Cats hold of the battling Lady Indians, but they also added 10 points to seal the deal on a double-digit victory. 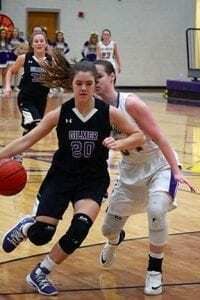 The Gilmer Lady Cats will travel to Northwest Whitfield on Tuesday for the final game of the 2018-2019 regular season. A win over the Lady Bruins will bring the two teams into a virtual tie for 1st place in Region 6-AAAA with the postseason tournament coming up. Closing out the afternoon trip to Dahlonega had the Bobcats and Indians take the floor. The Gilmer boys are also having a great season and holding down the #2 spot in the region. On the other side, the Lumpkin Indians are closing out a disappointing season with just 6 wins overall coming into Saturday’s action. Coach Hice and his team will travel to Northwest Whitfield on Tuesday in the finale of the regular season. 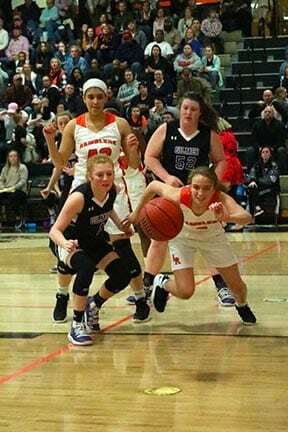 The indoor version of Friday night lights took place at LaFayette High School as the Lady Cats pounced on the floor and clawed their way to a big region victory. Needing the win to hold the #2 spot, the girls showed they are a team to be reckoned with. The Gilmer Lady Cats came out ready for what the Lady Ramblers would bring. Both teams fought hard throughout the four periods of play. as the first period came to a close, the Lady Cats held a narrow 3 point lead over LaFayette at 10-7. Hope Colwell and MaryLee Callihan combined to put up 9 of the 10 points for Gilmer. Continuing the hustle from period one, Coach Nunn had her girls focused on defense to hold their opponent’s scoring to a minimum. The LaFayette girls found a rhythm and a game plan in the second and edged Gilmer out Gilmer 15-10 to take a slim 2 point lead heading into the halftime intermission. 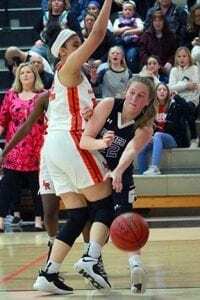 The second period scoring for Gilmer came from the hands of Bailey Teague with 4 points and Emma Deyton, Emma Callihan, and Elly Callihan each had 2 points each. As the second half started, the Lady Cats once again cranked up their defensive prowess allowing the Lady Ramblers just 5 third period points. While keeping the home team off the board, Gilmer’s girls opened the scoring gates. With input from the Callihan sisters, Bailey Teague, and Mallory Kiser, the Lady Cats went on a 21-5 run and stretched out a 41-27 lead as the buzzer sounded to end the third period of play. Heating up in the final period, the LaFayette Lady Ramblers battled back to the last second. Latyah Reece almost single-handily brought her team back within striking distance of the Lady Cats. 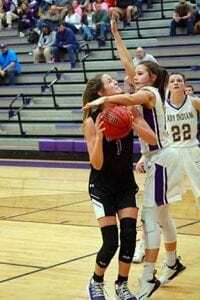 Reece scored 17 in the period but the Gilmer girls held on in the end for a 56-54 win. 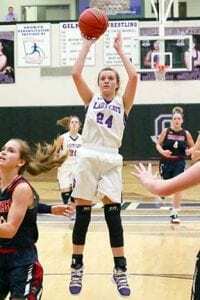 Leading the scoring for the Lady Cats was Elly Callihan with 14 followed by Bailey Teague(11), Mallory Kiser(8) and Emma Callihan had 7 on the night. Gilmer will travel to Lumpkin on Saturday afternoon for a non-region game before they travel to Northwest Whitfield on Tuesday. Tuesday’s game will be the final of the 2018-2019 season and set the seeds for the postseason tournament. 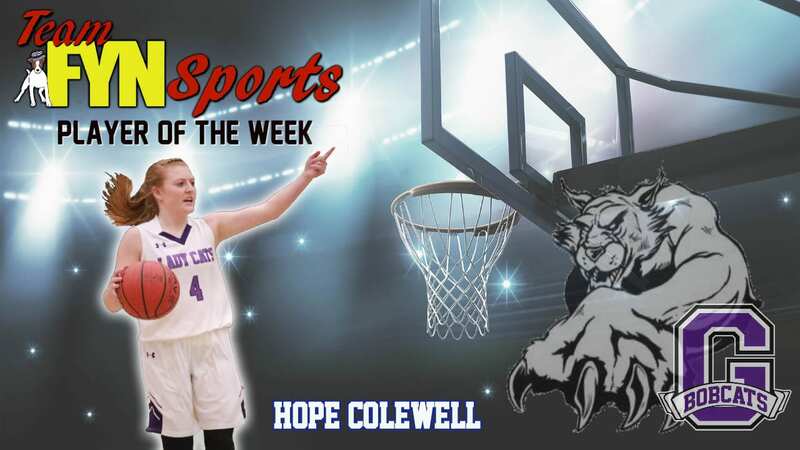 The Team FYN Sports Player of the Week for the Gilmer Lady Cats is Hope Colewell. 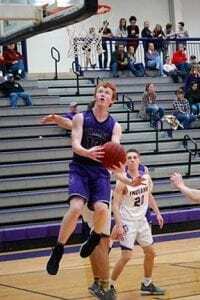 Colwell provides senior leadership on a daily basis at practice and in games. 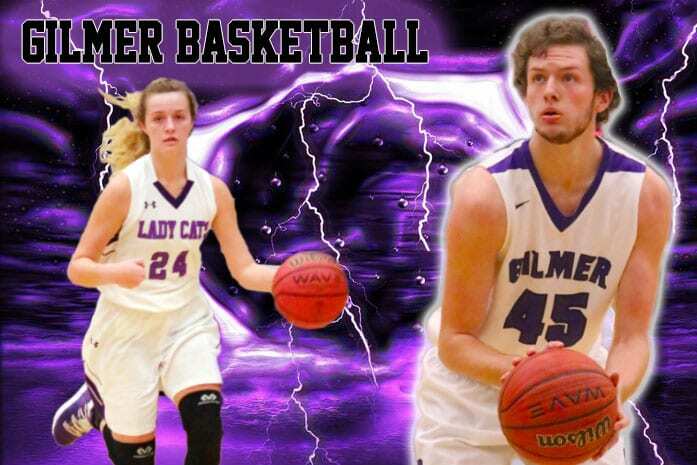 Wearing the number 4, she plays a vital role with excellent defense and the ability to shoot the 3-pointer to keep the Lady Cats in any game. 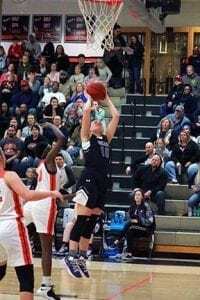 Colwell Scored 9 points in the first 2 games of the 2018-2019 season. 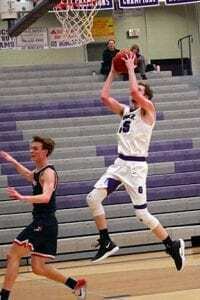 Gilmer High School basketball brought more excitement to the Cage on Tuesday as the Heritage Generals came to town for a big region match-up. The Lady Cats took the court first and as expected the game came down to the final minutes. The Lady Generals took game one earlier in the season and wanted to get another win and pretty much end the region hopes for the Lady Cats. Knowing a battle was about to ensue, Gilmer stepped up to the challenge and came away with a close victory. Emma Callihan had a dominating 1st period with 11 points to almost outscore the opponent by herself. As the 1st came to an end the Lady Cats found themselves with a narrow 19-14 lead over Heritage. The points continued to fall for the home team led by Emma Deyton in the 2nd to stretch the lead from 5 at the beginning to 13 heading into intermission 37-24. The second half started with the Lady Generals fighting back with 20 points in the third and close the gap on the scoreboard. With the score now 49-44 heading into the final period, Gilmer played consistent adding 12 points. As the clock wound down, Heritage narrowed the margin once again at 60-58 in favor of the Lady Cats. A big free throw from Mallory Kiser gave Gilmer a 3 point lead with under a minute left in the game. Last ditch efforts from the Lady Generals fell short to give Gilmer the big win. The Lady Cats travel to Ridgeland for a huge region game. Emma Callihan led the scoring with 20 points on the afternoon. Taking the court in game two of the night, the varsity Bobcats hit the floor and left no doubts on who was the better team. Playing a Heritage team that has the capabilities to both put up a lot of points and shut down their opponents, could not get either gong on Tuesday. In the dominating victory for the Gilmer Bobcats, the 2nd and 4th periods were telling moments in the game. The 2nd saw the Cats outscore the Generals 20-7 while the 4th had 21-6 run to nail down the large margin win. Having a good game in scoring for Gilmer was Tripp Pierce with 11 points and Braden Jenkins scoring 12 on the night. I what seems to has become a part of the normal, Kell Weaver led all scoring with 18 for the Bobcats. Weaver scored from just about everywhere on the floor. 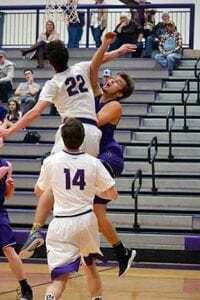 He also had several blocks and rebounds to aid in keeping their opponent’s points to a minimum. The huge 68-38 win for the Bobcats brings them to 15-5 overall and 5-3 in region play. The Cats will play at Ridgeland on Friday night and try to keep 2nd place in the region with LaFayette sitting atop with a 7-1 record. Coming off a good week of basketball the Lady Cats had several standout players. One specifically comes to mind not only for her play but also for her encouragement to her teammates when she wasn’t in the game. 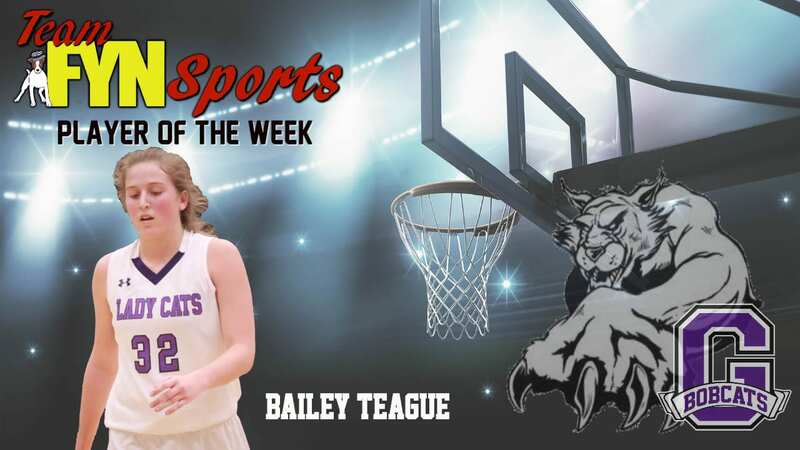 Bailey Teague comes into the games ready to contribute both as an offensive and defensive player. Teague hustles every minute that she is on the floor and when she isn’t Teague is nonstop encouragement to her Lady Cat teammates and friends.